Made of a cutting edge new nano-carbon that provides superior protection as well as instant customization, Powers International's new batsuit is a technological achievement that will change the face of super heroics forever. When Batman "died" fighting the Joker (even by comicbook terms, it was a brief death - he was revealed to be alive at the end of the very next issue, so credit them at least for not leaving us hanging on what we knew was the inevitable), his old friend James Gordon took over the role. But while Gordon had been a Marine, he wasn't a martial artist, so he needed some extra protection. 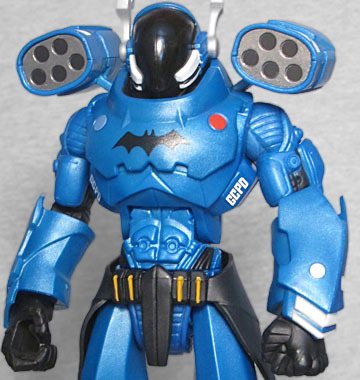 The Bat-bot, nicknamed "Rookie" by Gordon, is the build-a-figure for DC Multiverse Series 4. 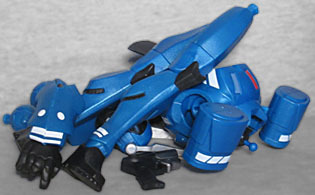 If you manage to find all five figures in this series and decide to buy them, you'll be able to build this big blue beast. Click the seven pieces together and he's ready to fight for justice! The "bat" part of this bat-bot could really stand to be a little more defined. When the design was first revealed, it was derided for looking like a rabbit, thanks to the two large silver antennae rising up off its black domed head. And we're not just talking about the fan reaction, here: people in the comic reacted the same way! You really must wonder what the thinking was; if characters in the story are referring to it as looking more like a bunny than a bat, then we have to assume that was an intentional choice; but why would the creators make that choice? What narrative goal was served by making it look this way? Other than the ears, the robot really does look like something a police force in a world with superheroes might design. It's quite human in shape, with skinny, angular legs, a narrow stomach and bulbous chest, and normal arms with large armored panels mounted on them. It's far beyond anything that could currently exist in the real world, but for a planet that has a Gotham City and Metropolis in it? Sure, this seems feasible. The long legs create a feeling of speed, while the big arms say "power." Of course, the big rocket pods on the shoulders don't hurt any, either. 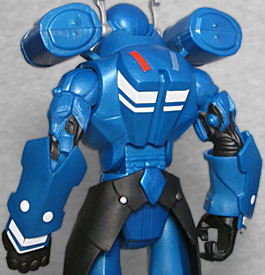 The Bat-bot is blue, reinforcing the idea that this is a piece of police equipment, though it still has the black batsymbol painted on the chest. There are white details on the ankles, wrists, and the upper edge of the multi-response rocket launchers, plus big block GCPD lettering on the ribs. Plus, because this is technically a police vehicle, it has flashers! Red and blue lights on the chest and back. Sure, they're just painted, not clear or anything, and the blue of the light nearly matches the blue of the body, but still: how terrifically fun! 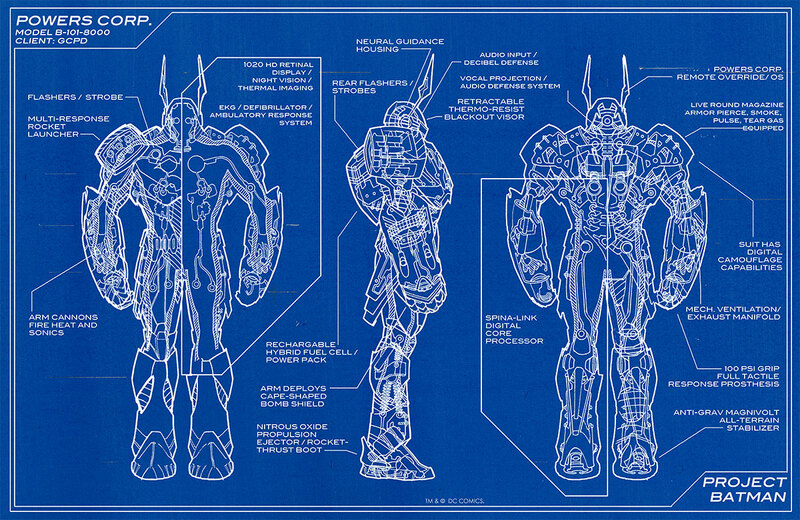 The bot is much taller than a human - so much so, in fact, that even the official blueprints that show how someone would fit inside have to cheat. I mean, when a human's shin only comes down as far as the robot's knee, either that thing isn't going to be able to bend, or the leg is going to snap the first time it tries to. 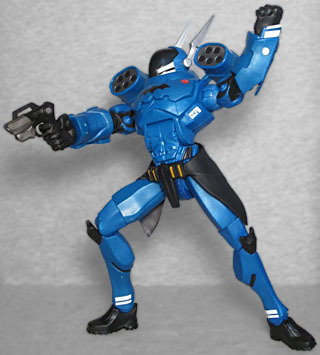 In any case, Rookie moves like any DC Mattel figure, with swivel ankles, hinged knees, swivel thighs, swivel/hinge hips, a swivel waist, hinged torso, swivel wrists (accomplished at the top of the forearm armor, not at the hands), hinged elbows, swivel biceps, swivel/hinge shoulders, and a balljointed head. So ignore the logisitics of actually fitting a human inside here pose to your heart's content. Thanks to the ears, the figure is 9⅝" tall. 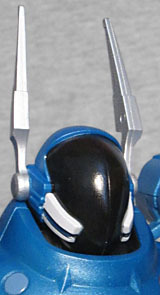 The figure also gets something of a rarity: an accessory designed for use by a BAF! A cop is still a cop, even inside a big mech suit, so naturally it carries a sidearm. 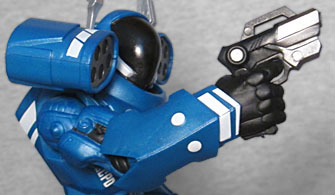 In the robot's hand it's just a wee pistol, but for a normal human, it would be a two-handed cannon. It doesn't holster anywhere, so the toy will be fated to hold it forever. There's also a play feature here, one that no one was expecting. When DC Direct made their version of this armor, it was in a two-pack with Jim Gordon, and the Bat-bot had a flip-up panel on the chest that allowed you to swap the robot's head for a piece depicting Batman peeking out. A cool little touch, but obviously not one Mattel was going to be able to copy. However! When you're putting the figure together, you might notice that the balljoint for the head is smaller than you might expect. Why's that? Because it's sized to accommodate the head from the single-carded Gordon Batman! How about that! And, why, would you look at that! 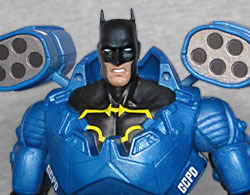 The panel on the front of the robot's chest is removable, revealing a section of Batman costume beneath - Mattel found a way to expose Gordon after all! That's awesome! I honestly never intended to complete this Build-A-Figure. I wasn't interested in most of the figures in this series, and DCD's seemed to be a higher quality design. But when I found the figures at that KB Toys, I ended up getting them. And that is why, as Shocka said, physical brick-and-mortar toy stores will always matter. An impulse buy in person is not the same thing as an impulse buy online; digital splurging may be easier, but it lacks the surprise and immediacy. Bat-bot turned out way better than I expected, but I'd never have known that if not for the toys being physically put in front of me.